Siaya can be described as a sleeping giant. This is a county of greats; great leaders, the great lake Victoria and the rivers Yala and Nzoia; with great power harnessing potential. We count devolution as God sent because for the first time many people from this region are looking back towards home for investment opportunities. We believe devolution shall check the rural to urban migration trends and bring back the much needed brains, long drained by the search for greener pastures far away from home. As a result of many Siaya residents moving to look for work outside, there are vast tracts of arable land and also land for real estate investment; all these are opportunities we are keen to engage the diaspora in. The potential is unbelievable and that’s why for us Siaya people the thought and talk of more resources coming to the devolved units is music to our ears; these are areas that had been starved of much needed funds and infrastructure, but now looking ahead we are asking just what can we do? And on this note I have hosted a number of visitors from within and without coming to us the county government with ideas. We as residents of Siaya need not go far to understand the importance of devolved funds and the obvious advantages of government availing infrastructure; the tarmacking of the Ngi’ya-Kogelo-Ndori road when Barrack Obama became president, has exponentially changed the landscape of that area. We are keen on investments in agriculture. With the great rivers of Nzoia and Yala flowing through our county, relying on rain-fed agriculture should be a thing of the past. And that’s why my government launched the ongoing subsidised Tractor-ploughing project; many Siaya farmers can now access tractor services at below the market prices. We shall also endeavour as a county government to set a great example in mechanised agriculture. Investors like the Dominion group in the Yala swamp have already shown us where we can go with our vast virgin lands. 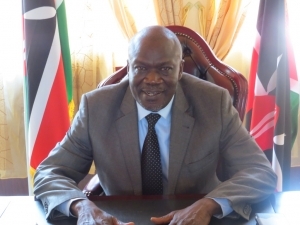 Like I have always said Siaya is going to be a University town; talks with Florida University in the US are at an advanced stage, and other local universities have also expressed Interest. This website is the tip of the iceberg, the bulk of it comes out when the fiber-optic cables arrive. This will be of great utility in opening up the County with information flowing in and out. I am an optimist and I can assure you, the future of Siaya is too bright, on a light note, Siaya residents should consider wearing dark glasses; the future is just blindingly bright!